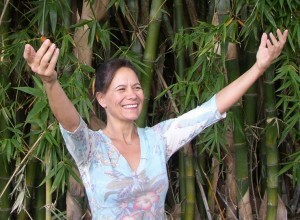 Qigong for Fitness is a holistic movement program that promotes health and wellness through the ancient Chinese practice of Qigong and core principals of Energy Medicine, with an emphasis on Energy Exercises. Integrating elements of Tai Chi, students also improve balance, coordination, flexibility and strength. Classes are ideal for anyone wishing to reduce inflammation or joint pain. Maryna’s BA and MFA in Dance give her the training to also integrate appropriate stretches and exercises that safely warm and strengthen the joints and muscles in an artistic choreographed way so that one movement flows into the next. Specifically, this class focuses on removing toxins and energy blockages in the Chinese meridian system, acupuncture points, neurolymphatic points, lymph system, muscles and joints. In doing so, proper and healthful flow of ‘Qi’ or energy can be restored. Qigong ‘meridian stretches’ and energy balancing exercises not only remove energy blocks and improve muscle tone and flexibility, but also oxygenate the body, reduce stress, calm the mind and improve immunity and the body’s ability to heal itself. Energy Exercises, developed by internationally-acclaimed author and teacher Donna Eden are integrated to support the removal of toxins and optimal flow of energy, create better harmony between the brain and the body and all the energy systems, strengthen the immune system, enhance metabolism and digestion, improve mental functioning & clarity, calm the nervous system, improve coordination, increase energy levels, and feel more balanced, positive and confident. Exercises also strengthening the ‘bio-field’ or aura to protect the body’s energies and health. Classes are appropriate for all ages and fitness levels. Those recovering from illness or injuries can either comfortably participate in a chair or practice modified versions of the movement. The exercises are easy to follow and are practiced to inspiring and uplifting music. Breathing exercises and meditation are also incorporated to make this physical practice quite relaxing and rejuvenating.